I’d been running my entire life. Not literally running, of course. But chasing a peace that always felt just out of reach. I worked hard to fix all my flaws and exhausted myself trying to prove I was worthy of love. However, in the process of running and trying and proving, I actually ran away from my truest self. In running away from the truth about my brokenness, I was running away from the very thing I needed most of all: to know my truest self. My flawed, complex, wounded, childish self. This is why our modern self-esteem strategies don’t work like we want them to. They deny the truth, and instead teach us to “call out our greatness,” to focus on our goodness and deny our lackings. We puff ourselves up with stellar efforts and positive affirmations that, at heart, we know don’t ring true. Yes, positivity is important. But positivity without self-awareness is incomplete. We need both, and without them we’ll never truly be whole. That’s the beauty of the Gospel. It is the only narrative in which you and I can be fully ourselves—both beautiful and broken—and fully loved. There, in the white-hot light of God’s holiness, the truth about the darkest self is seen for what it is. No running, and no hiding. Every flaw and failure exposed. At the same time, the very parts of ourselves that we wish to hide are received, desired, healed and loved. Transformation doesn’t begin by working harder to make ourselves better. Instead, it begins by embracing our whole selves, both our bitter struggle and our great redemption. We are created by a God who knows us better than we know ourselves, who longs to gather up all the scattered pieces and hold us in His hand as a redeemed whole. Still flawed, but infinitely loved. There, in this honest place of both deep humility and abundant grace—we can finally look in the mirror without shrinking back.Our value isn’t found in our efforts, talents, achievements, relationships or appearance. We are enough because He is enough! 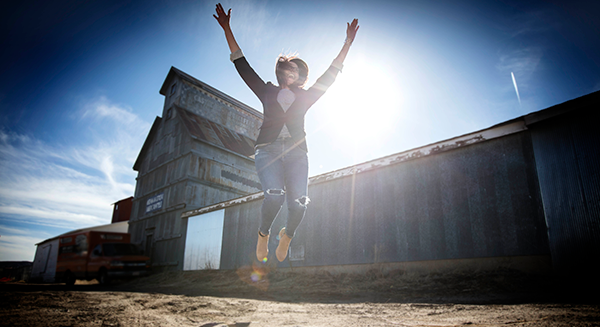 If you’re longing to make peace with yourself, to live from an inner core of solidity and confidence, then join me for the six-week I Am Online Experience! Starting October 2, we’re going to dig deep into the truth about who we are. No fear, no shame, no running or hiding. Instead, raw honesty, hard questions, and abundant love. Through live video, Facebook conversations, Q&A, and personal interviews, I’m going to give you an inside glimpse of my ongoing battle. We’ll explore the complexities surrounding the subject of identity and, in the process, you’ll feel less crazy and alone. End, once and for all, the barrage of negative self-talk and shame with an empowering new narrative. Refuse to ride the rollercoaster of others’ opinions and start believing what God’s says about you. Stop agonizing over past regrets and failures and make peace with God’s sovereign plan for your life. Abandon chronic self-doubt, and instead embrace God’s personal affection. For YOU. 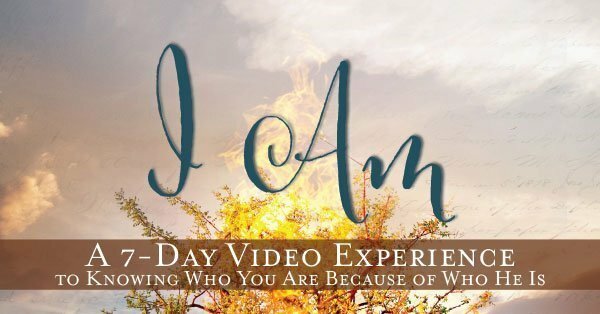 Sign up for the I Am Online Experience HERE. All you need is a first name and email address. It’s that easy. 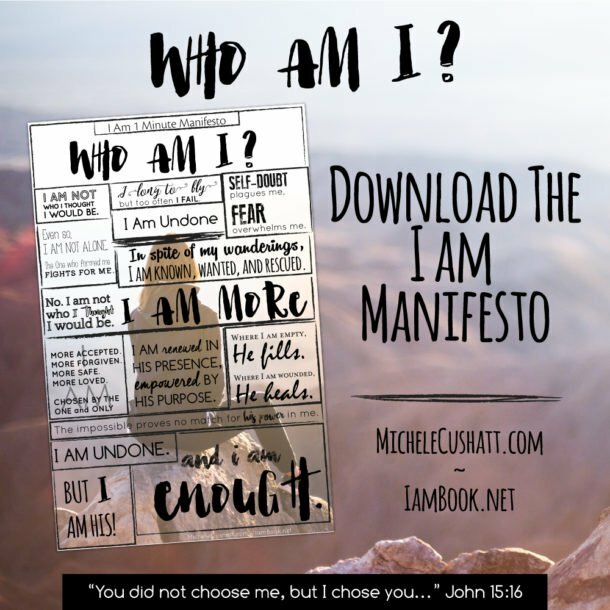 Make sure you have a personal copy of I Am: a 60-day Journey To Knowing Who You Are Because of Who He Is. I’ll be using concepts from the book and the Bible to facilitate real change. There’s nothing magical about me. But there is real power in the Truth of God’s word. Consider inviting a friend (or three) to join you. They can be local or long distance, doesn’t matter. The point? There’s something powerful about learning together. My most radical and lasting transformations happened in the context of relationship. That’s it! Once you register, you’ll receive an email from me welcoming you to the family AND giving you an idea of what the following six weeks will look like. 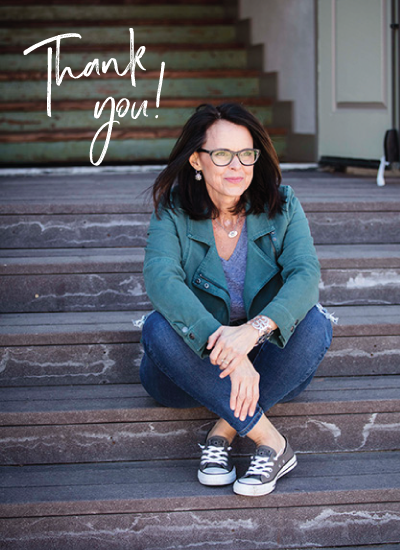 Michele I’d first like to thank you for the book “I Am” and for being you! All that you do to lift up others. I need purchase a few more to hand out to people! I look forward to joining you in this online experience.. it will be so great! See you there! This post resonates with me so much. For years I didn’t know who I was. I couldn’t find peace in my faith, life or relationships. I ran on anxiety and fears that plagued me for years. Until I learned to accept myself as a child of God. Imperfect and that was okay. Through thousands of surrenders and just wrapping myself in His love for me… I finally had begun a healing journey like you I’m still on. One that has to lead me to find peace in the midst of life’s challenges. God is so good! Hi Michele, this post really resonates with me. I clicked on the above to sign up but it said page not found? Oh, I see this post and online experience was last year! Sorry about that. Thanks for posting it again. I really needed it.